One thing I do not understand is the L3 termination at the end. Can you assign the same IP address to different EVC? It's not possible to use ip addresses under service instances. You have to use subifs or SVIs and in both cases you can't have the same ip address on different interfaces. Btw, what would be the reason for doing that? I'm not sure if you've tried the EVC framework on ASR9K platform. I'll put my question here anyway. My question is that: Are there any restrictions on the interfaces to be added in a bridge-domain? My idea is: On top of the two tags received on the Gi0/1.10001001 interface, two new tags will be imposed on the frame which are 2000 and 2002. On the outgoing (Gi0/2.30003003), another two new tags (3000 and 3003) are added on top of these frames. The result is to get at least 6 tags on the frames going out off Gi0/2. Apparently, this doesn't work. My guess is that because the im-balance of configurations, clearer - the vlan-tag operations, between the two member interfaces, the bridge-domain doesn't work at all. But I'm not sure about this. Do you have any idea on this? Or do you know how the bridge-domain works? I tried to search but found nothing. If I change the configuration from bridge-domain to xconnect, it works as expected. So, bridge-domain does have restrictions. Since i got my hands on a ASR9k, i believe your problem might be the mtu (you have to configure the mtu under the bridge-domain). Thank you for your useful post. Hope you will write new post about bridge-domains as soon as possible. Please confirm me this is correct? Your config will translate vlan tag 10 to 20 and then add vlan tag 20 over it, so it will not work. I have two PCs that in turn send packets with two vlans 300|102 and 300|101 to port gi1/1 of router. Can I do ping between two PCs? ping should work between them. In the context of Metro EThernet would it be correct to say that for configuring a service we can either configure an EVC using connect EVC command or simply associate bridge domain with the relevant service instances. In last port of the section, you have same IP address for two sub interfaces. can you do that? By the way, Great post. bridge-domain, although can be used for p2p, is commonly used for p2mp. Also bridge-domain needs a global vlan. The example implies that you won't use both subifs at the same time. Are there any resources that you would recommend to get more familiar with mapping? Last time i checked, CCO had some examples. Also Cisco support forums might contain some extra information. I only start to study EVC framework. And have a little question. 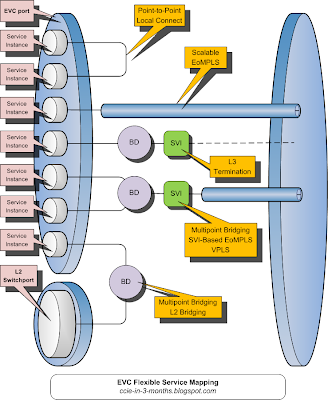 I want 3 vlans 300-302 to be in 1 bridge-domain and have L3 terminated. It's seems that all is ok - pings between hosts in those vlans are successful. This config also works. But what is right? Is the below configuration valid? Can i have the same customer vlan but with 2 different s-vlans mapped to two different service instances?